DMM connectors offer a high pin density (2mm pitch for signal contacts), as well as hybrid contacts (low frequency, high power), which contribute to equipment miniaturization. Compared to Micro-D connectors they offer a higher density, a lower profile and thus offer a much lighter solution. 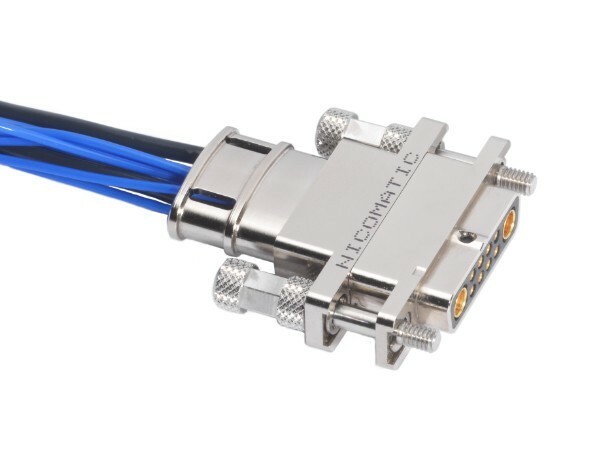 Nicomatic fixings are the same whether you use a male or female connector, covers are mountable without modifying the front or rear panel and the philosophy of the system is to be modular. The addition of a metal shield enables resistance to external factors such as electromagnetic interference (EMI), and grounding. The cover design is a good match to the back shell and leads to cost reduction. Their compact design is ideal for miniature and portable devices or equipment used in the field, as well as on-board electronics, rack and panel. For example the right angle (V type) connector offer the most compact solution seen on the market. The connectors are designed and tested to withstand extreme conditions and comply with MIL-DTL-83513G (Micro-D standard). The qualification tests are passed with the EIA procedure. In creating a connector system with a lower profile than the traditional MICRO-D, and in using standard components (fixings, HF, HP, LF contacts etc. ), the cost of the product is reduced. In the same panel cut-out one can either use a male or female connector as the shape and size fit to the hole. This is true both for rear and front mounting.